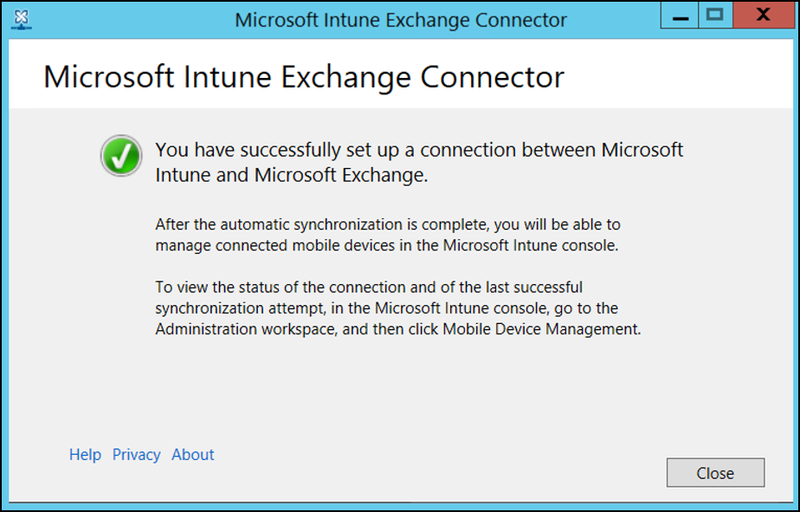 The information in this article will help you install and then monitor the Exchange Active Sync on-premises connector for Intune. You use the Intune on-premises Exchange connector with your conditional access policies to allow or block access to your Exchange on-premises mailboxes. When a device tries to access your on-premises Exchange, the Exchange connector maps Exchange Active Sync (EAS) records in Exchange Server to Intune records to check for device enrollment with Intune, and compliance to your device compliance policies. Depending on your conditional access policies, the device can be allowed access, or blocked. For more information, see What are common ways to use conditional access with Intune? Intune supports installing multiple on-premises Exchange connectors per subscription. If you have more than one on-premises Exchange organization, you can set up a separate connector for each. However, only one connector can be installed for use each individual Exchange organization. Download the Intune on-premises Exchange connector from the Intune portal. Install and configure the Exchange connector on a computer in the on-premises Exchange organization. Repeat these steps for each additional Exchange organization you want to connect to Intune. You'll need an account with an Intune license that can be used by the connector to connect to Exchange. The account is specified when you install the connector. The following table lists the requirements for the computer on which you install the on-premises Exchange connector. Operating systems Intune supports the on-premises Exchange connector on a computer that runs any edition of Windows Server 2008 SP2 64-bit, Windows Server 2008 R2, Windows Server 2012, Windows Server 2012 R2, or Windows Server 2016. The connector isn't supported on any Server Core installation. Microsoft Exchange On-premises connectors require Microsoft Exchange 2010 SP3 or later or legacy Exchange Online Dedicated. To determine if your Exchange Online Dedicated environment is in the new or legacy configuration, contact your account manager. Mobile device management authority Set the mobile device management authority to Intune. Hardware The computer on which you install the connector requires a 1.6 GHz CPU with 2 GB of RAM and 10 GB of free disk space. Active Directory synchronization Before you can use the connector to connect Intune to your Exchange Server, you must set up Active Directory synchronization so that your local users and security groups are synchronized with your instance of Azure Active Directory. Additional software A full installation of Microsoft .NET Framework 4.5 and Windows PowerShell 2.0 must be installed on the computer that hosts the connector. Network The computer on which you install the connector must be in a domain that has a trust relationship to the domain that hosts your Exchange Server. The computer requires configurations to enable it to access the Intune service through firewalls and proxy servers over Ports 80 and 443. Domains that are used by Intune include manage.microsoft.com, *manage.microsoft.com, and *.manage.microsoft.com. On a supported Windows Server operating system for the on-premises Exchange connector, open the Azure portal and sign in with a user account that is an administrator in the on-premises Exchange server, and that has a license to use Exchange Server. Under Setup, choose Exchange ActiveSync on-premises connector, and then select Add. On the Add Connector page, select Download the on-premises connector. The on-premises Exchange connector is in a compressed (.zip) folder that can be opened or saved. In the File Download dialog box, choose Save to store the compressed folder to a secure location. Do not rename or move the files that are in the on-premises Exchange connector folder. Moving or renaming the folder's contents will cause the Exchange connector installation to fail. 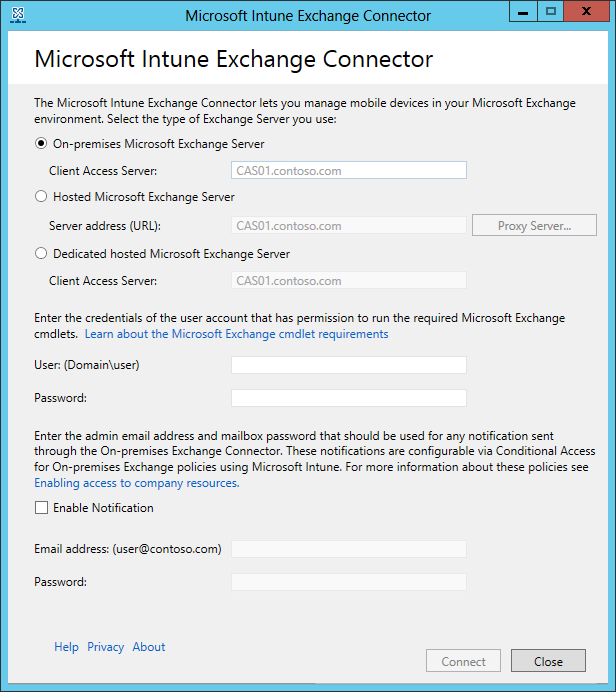 Perform the following steps to install the Intune on-premises Exchange connector. If you have multiple Exchange organizations, repeat these steps for each additional Exchange connector you want to set up. On a supported operating system for the on-premises Exchange connector, extract the files in Exchange_Connector_Setup.zip to a secure location. After the files are extracted, open the extracted folder and double-click Exchange_Connector_Setup.exe to install the on-premises Exchange connector. If the destination folder is not a secure location, you should delete the certificate file MicrosoftIntune.accountcert when you are finished installing your on-premises connectors. In the Microsoft Intune Exchange Connector dialog box, select either On-premises Microsoft Exchange Server or Hosted Microsoft Exchange Server. For an on-premises Exchange server, provide either the server name or the fully qualified domain name of the Exchange server that hosts the Client Access Server role. Open Outlook on the web for Office 365. Choose the ? icon at the upper left, and then select About. Locate the POP External Server value. Choose Proxy Server to specify proxy server settings for your hosted Exchange server. Select Use a proxy server when synchronizing mobile device information. Enter the proxy server name and the port number to be used to access the server. If it's necessary to provide user credentials to access the proxy server, select Use credentials to connect to the proxy server. Then enter the domain\user and the password. In the User (Domain\user) and Password fields, enter the credentials that are necessary to connect to your Exchange server. The account you specify must have a license to use Intune. Provide the necessary credentials to send notifications to a user’s Exchange Server mailbox. This user can be dedicated to just notifications. The notifications user needs an Exchange mailbox to send notifications by email. You can configure these notifications with conditional access policies in Intune. Ensure that the Autodiscover service and Exchange Web Services are configured on the Exchange Client Access Server. For more information, see [Client Access server](https://technet.microsoft.com/library/dd298114.aspx). In the Password field, provide the password for this account to enable Intune to access the Exchange Server. It might take a few minutes for the connection to be configured. During configuration, the Exchange connector stores your proxy settings to enable access to the Internet. If your proxy settings change, you'll have to reconfigure the Exchange connector to apply the updated proxy settings to the Exchange connector. After the Exchange connector sets up the connection, mobile devices that are associated with users that are managed in Exchange are automatically synchronized and added to the Exchange connector. This synchronization might take some time to complete. If you have installed the on-premises Exchange connector, and if at some point you delete the Exchange connection, you must uninstall the on-premises Exchange connector from the computer onto which it was installed. Intune supports multiple on-premises Exchange connectors per subscription. For a tenant with multiple Exchange organizations, you can set up a connector for each Exchange organization, but only a single connector for any single organization. If you'll install connectors to connect to multiple Exchange organizations, download the .zip folder one time and then reuse that same download for each connector you install. 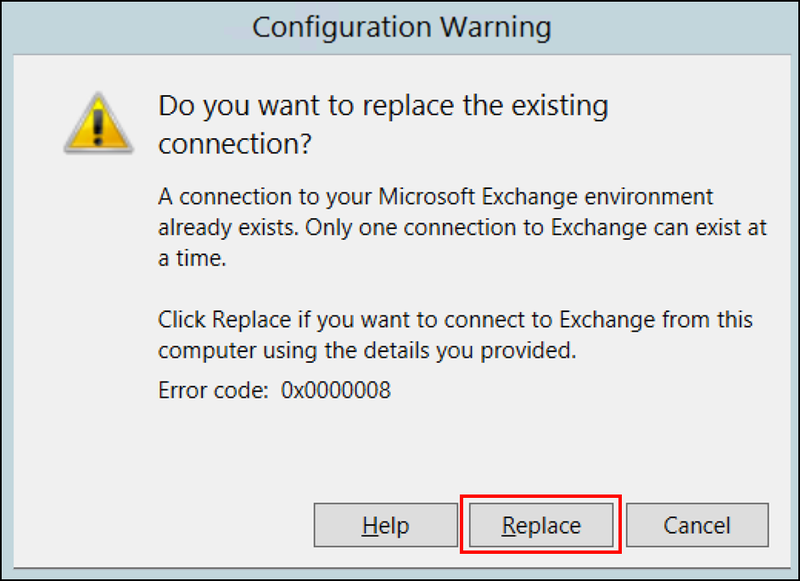 For each additional connector, follow the steps in the previous section to extract and run the setup program on a server in the Exchange organization. The high availability, monitoring, and manual sync features described in the following sections are supported for each Exchange organization that connects to Intune. High availability for the on-premises Exchange connector means that should the Exchange Client Access Server (CAS) that the connector uses become unavailable, the connector can switch over to use a different CAS for that Exchange organization. The Exchange connector itself does not support high availability. If the connector fails, there is no automatic failover and you must replace that connector by installing a new connector. On the server where the Exchange connector is installed, go to %ProgramData%\Microsoft\Windows Intune Exchange Connector. Using a text editor, open OnPremisesExchangeConnectorServiceConfiguration.xml. Change <IsCasFailoverEnabled>true</IsCasFailoverEnabled> to <IsCasFailoverEnabled>false</IsCasFailoverEnabled> to disable the feature. You might need to reinstall an Exchange connector. Because a single connector is supported to connect to each Exchange organization, if you install a second connector for an organization, the new connector you install replaces the original connector. Use the steps from Install and configure the Intune on-premises Exchange connector to start installation of the new connector. When prompted, select Replace to install the new connector. Continue using the steps form the previous procedure, and log into Intune again. When presented with the final screen, select Close to complete the install. On the Intune Dashboard, choose Exchange access. Select Exchange on-premises access to verify the connection status for each Exchange connector. Beginning with the Intune 1710 release, you can use the Operations Manager management pack for Exchange connector and Intune. Using the management pack gives you different ways of monitoring the Exchange connector when you need to troubleshoot issues. An on-premises Exchange connector automatically synchronizes EAS and Intune device records regularly. If the compliance status of a device changes, the automatic sync process regularly updates records so that device access can be blocked or allowed. Quick sync occurs regularly, several times a day. A quick sync retrieves device information for Intune-licensed and on-premises Exchange conditional access-targeted users that have changed since the last sync. Full sync occurs once per day by default. A full sync retrieves device information for all Intune-licensed and on-premises Exchange conditional access-targeted users. A full sync also retrieves Exchange server information and ensures that the configuration specified by Intune in the Azure portal is updated on the Exchange server. Select the connector you want to sync, and then choose Quick Sync or Full Sync.